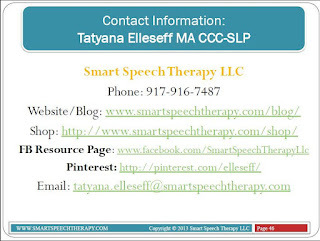 I was recently approached by Tatyana over at Smart Speech Therapy LLC to do a product swap/review. 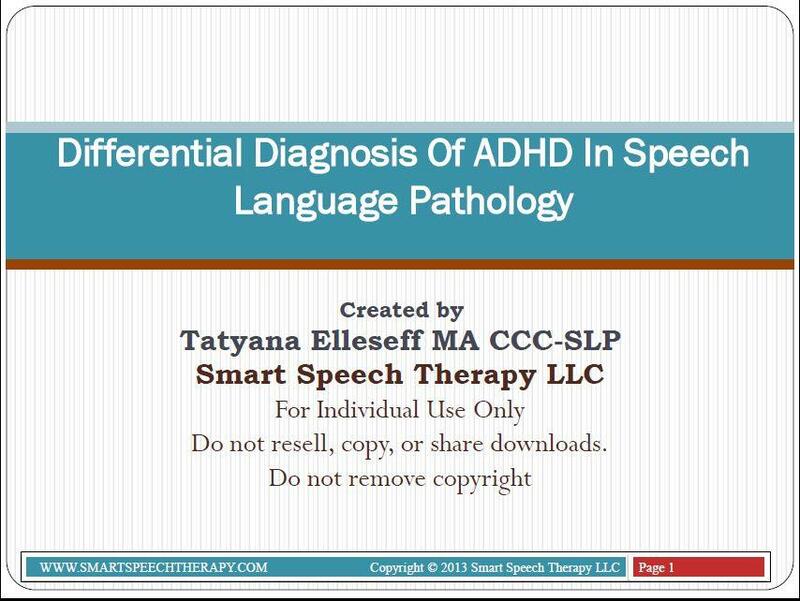 I jumped at the chance to review her slide presentation titled, Differential Diagnosis of ADHD in Speech Language Pathology. I have a new student this year who has probably the most significant case of ADHD that I have ever seen, but, I always wonder if something was missed. Does he really have ADHD, or is it something else? This packet that Tatyana has created answered a lot of my questions, and is full of great information. The Goals and Objectives of this presentation are clearly presented and definitely covered in the packet. ADHD Statistics- Wow! Did you know that as of 2007, 5.4 million children ages 4-7 years of age have ever been diagnosed with ADHD?!? What if its not ADHD?- Tatyana reports that nearly 1 million children are potentially misdiagnosed. Case Studies- 4 different children. Each case study contains background information, assessment results, diagnostic findings, discussion and learning outcomes. I thought this was a very informative packet! The case studies were really interesting and made me think about students that I have known. Sometimes it is easy to just take a physicians diagnosis of ADHD and run with it. Tatyana reminded me that we need to look deeper. There may be a language disorder that is presenting with ADHD like symptoms. Thanks to Tatyana for allowing me to preview such a great product! Tatyana is currently reviewing a product of mine: If You Give A Mouse A Cookie: A Phonemic Awareness Book Companion at her blog. You can check out her review of my phonemic awareness book companion HERE. Leg paresis is very fatal disease.I am able to learn very informative information about hover signs which is one of this site two symptoms of Leg paresis.Your great way of presentation have made it easy for me.